Today our atmosphere consists mostly of nitrogen (about 78%) and oxygen (21%) plus carbon dioxide and other trace gases (about 1%). The nitrogen is injected into the atmosphere during volcanic eruptions. The reason nitrogen is so plentiful in the atmosphere is that it does not easily combine with other chemicals. Oxygen is of special interest because most life forms depend on oxygen. Yet it wasn’t always present in the air. How do scientists know that there was no oxygen in Earth’s early atmosphere? Where did the oxygen come from? What was its effect on early life? The answers to these questions lie in rocks that contain the element iron. Iron provides an important clue because it combines so readily with oxygen. If you leave an iron nail outdoors in wet weather, the nail becomes rusty. The technical name for rust is iron oxide (Fe2O3), which is a compound of iron and oxygen. Many (though not all) rocks that are reddish in color contain iron oxide. Iron can also combine with elements other than oxygen. In this chapter we look at two different types of rock formations that incorporate iron: layers of iron-rich rocks called banded iron formations that formed before about 2.1 billion years ago, and rusty red sandstone deposits called redbeds that formed after about 2.1 billion years ago. These two iron-rich rock formations provide evidence that something unusual occurred about 2.1 billion years ago. Let’s find out more about how these rocks were formed, and then consider what that implies about the evolution of our atmosphere and life. Stir salt in water and it seems to disappear. You know it’s there because the water tastes salty, but it is no longer visible because the salt has dissolved in the water. Other minerals such as iron and silicon also dissolve in water. Similarly, gases such as oxygen and carbon dioxide dissolve in water. Water, in other words, consists not only of water molecules, which are made up of two atoms of hydrogen and one of oxygen (H2O), but also molecules of a variety of other substances floating in and around the water molecules. Like most other animals, fish depend on oxygen for life. But fish live in water so they cannot breathe as we do. Nor can they break apart molecules of water to extract the oxygen. Instead, as water passes through their gills, they take in molecules of dissolved oxygen (O2) that are floating freely in the water. Since these oxygen molecules are not chemically bound to any other substance, the gas is referred to as free oxygen. Geologists have identified some very old rock deposits that they call banded iron formations (or BIFs). 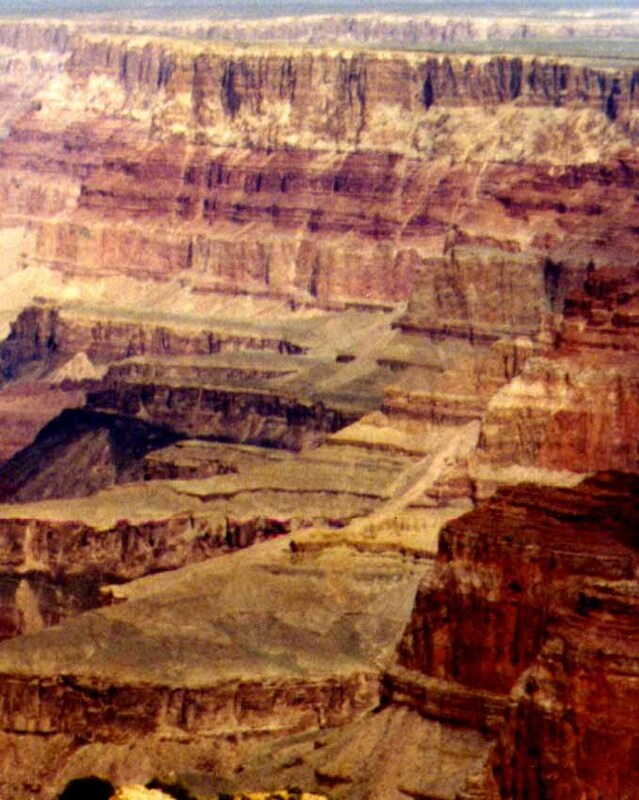 These formations consist of layers of iron-rich sedimentary rocks of various colors—blue, brown, red, or black. Most of the iron used today in cars, bridges, and other applications were mined from BIF formations. A plausible explanation for the BIFs begins with the dissolving of iron in the early seas. Iron from deep in Earth’s crust could have entered seawater as a result of volcanic action, and would have easily dissolved. The dissolved iron would then have dispersed in the ocean. The element silica also dissolved in the early oceans. Silica would have combined with some of the dissolved iron and formed thin layers of a dark rock, usually black or brown, called chert. Chert cannot dissolve in water, so it would have settled to the ocean floor. You may recall that blue-green algae existed in the early seas, starting about 3.5 billion years ago. These simple life forms absorbed carbon dioxide from the water, incorporated the carbon in their tissues, and released free oxygen into the surrounding water. When free oxygen encounters dissolved iron, it immediately combines with the iron, and iron oxide results. Iron oxide cannot remain in solution. It falls to the bottom of the ocean as particles of rust. During the spring and summer months, when light levels increased, the blue-green algae would have multiplied, releasing substantial amounts of free oxygen into the seawater. The oxygen would have combined with the dissolved iron in the water and become iron oxide. The iron oxide would then have settled to the ocean floor and formed a reddish layer. Season after season, year after year, alternating layers of iron-rich rocks would have been deposited at the bottom of the shallow seas. 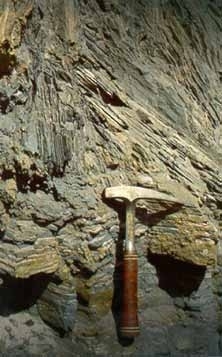 Black and brown chert, which formed year-round, would have created dark layers in between the reddish layers. This process explains the layered BIFs that we see today. Stromatolites and BIFs provide evidence of how and when free oxygen became abundant in the seas and atmosphere of our planet. That change took place about 2.1 billion years ago when the oxygen released by the blue-green algae finally used up all the iron dissolved in the world’s oceans. Having no more iron to combine with, oxygen in the seawater increased. When the seawater became saturated with dissolved oxygen, the oxygen bubbled to the surface. The bubbles popped and enriched the air. Prior to about 2.1 billion years ago, a piece of iron on land would not have rusted because there was no oxygen in the atmosphere. 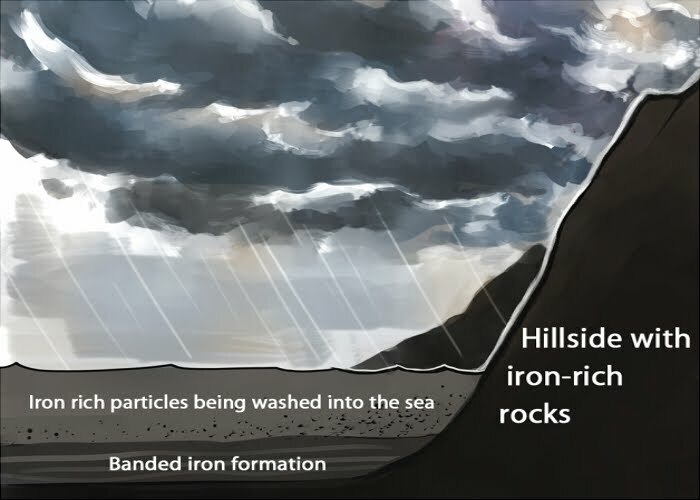 After about 2.1 billion years ago, when free oxygen entered the atmosphere, iron deposits on land began to rust when rain or moisture was present. Today, deposits of rust-red sandstone, dating from about 2.1 billion years ago, can be found in many places. These are called redbeds. The evidence of BIFs, which formed before about 2.1 billion years ago, and redbeds, which formed after about 2.1 billion years ago, indicate an important turning point in the development of life on our planet. Previous to that time there was almost no free oxygen in the atmosphere. Then the concentration of oxygen in the atmosphere increased gradually, and some 500 million years ago it reached its current level of about 21%. In the early years, unknown organisms all over the world must have been poisoned by this new chemical in the environment. But some species adapted and flourished under the new conditions. Tropical fish tanks often have an air pump that forces bubbled of air through the water. Oxygen in the bubbles dissolves in the water so the fish can breathe. When we think of oxygen, we naturally think of how we use it—to breathe. But oxygen is important in other ways as well. As oxygen continued to build up in the atmosphere, three fundamental changes took place. 1. Some carbon dioxide was removed from the atmosphere. Three or four billion years ago, the Sun was cooler than it is today, but Earth’s early atmosphere was rich in carbon dioxide, which warmed our planet. Because carbon dioxide is a greenhouse gas, it trapped the heat of the Sun. Then gradually, the Sun grew hotter. If our atmosphere had stayed with the same level of carbon dioxide, Earth might have become like Venus—too hot for life to evolve. Luckily, blue-green algae started to populate the early Earth. Like today’s plants, blue-green algae absorbed carbon dioxide from their surroundings. They incorporated the carbon into their tissues and released free oxygen. 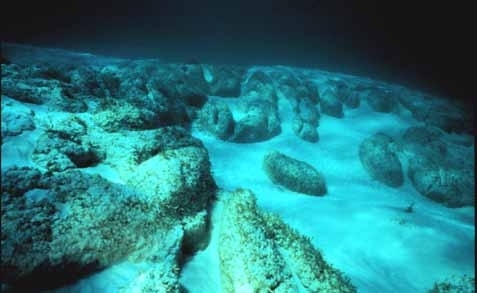 When the algae died, the carbon in their tissues was deposited on the ocean floor. Over the span of billions of years, the reduced amount of carbon dioxide lessened the greenhouse effect, so Earth did not overheat. Thanks to these tiny life forms, Earth maintained temperatures comfortable for the evolution of additional life forms. 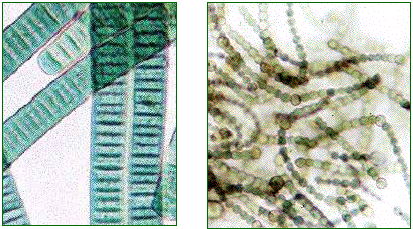 Living cyanobacteria, shown in these photomicrographs, are related to the earliest forms of life. Various forms of cyanobcateria make up the stromatolites show on the previous page. Images by Michael Clayton, University of Wisconsin, Madison. The earliest clear fossil evidence of life on land is the eight-legged Trignotarbida, similar to spiders. These organisms first appeared in the Silurian period. This illustrations from Karl Zittel's 19th century textbook on paleontology. 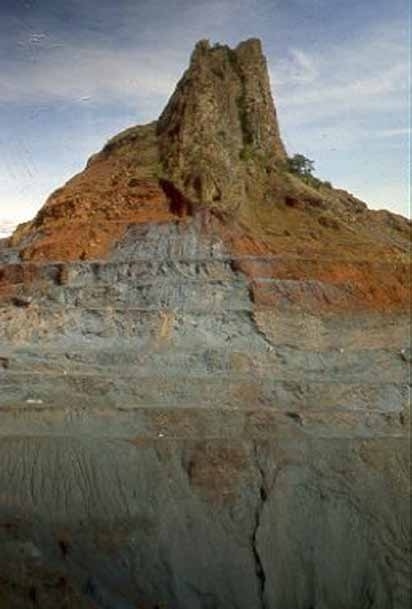 Image courtesy of the University of California Museum of Paleontology website. 2. The oxygen-rich atmosphere stimulated the evolution of life. How do you receive energy to live? By eating, of course. But food alone is not enough. The food needs to combine with oxygen to provide the energy you need to walk, talk, write, and think. The next breath you take is the first step in your body’s use of oxygen to release the energy from the food you have eaten. Oxygen is effective at releasing energy because it combines readily with many different elements. Once life forms evolved that could use oxygen as a source of chemical energy, many new microorganisms developed. Eventually, some single-celled organisms combined to form the first multicellular organisms. After sexual reproduction began, evolution started to pick up speed. An explosion of living forms—over millions of years—produced larger and more varied plants and animals, including, eventually, us! 3. Oxygen in the atmosphere helped to shelter Earth from ultraviolet radiation. As you have learned, plants absorb carbon dioxide and release oxygen. Oxygen molecules, composed of two linked oxygen atoms (O2), encountered ultraviolet rays from the Sun. Those energetic rays broke the bonds that held the two oxygen atoms together. Some of them simply recombined. But some of the individual oxygen atoms combined with oxygen molecules to form ozone (O2 + O —> O3). Ozone, the three-atom variety of oxygen, absorbs ultraviolet radiation. As the concentration of oxygen in the atmosphere increased, so did the amount of ozone in the upper atmosphere. Ozone helps to shield Earth from the Sun’s ultraviolet rays. Earth’s surface slowly gained some protection from the Sun’s life-killing rays, and it was then possible for some life forms to emerge from the protective ocean onto the land. Fossils called stromatolites tell us that about 3.5 billion years ago tiny single-celled algae began to grow and multiply. As a by-product of their life processes, they released free oxygen into the seas. In those early years, the oxygen in the water combined with dissolved iron to form BIFs. By about 2.1 billion years ago, when nearly all the iron in the seas was used up, the free oxygen bubbled to the surface and enriched our atmosphere. The presence of an oxygen-rich atmosphere helped to keep the temperature of our planet at a habitable level. Oxygen provided a source of energy that stimulated the evolution of a variety of life forms. And oxygen in the upper atmosphere formed ozone, which protected life on the surface from deadly radiation. The oxygen level reached its current value of about 21% some 500 million years ago. These developments paved the way for the explosion of living forms that were to come.